First look at a plain Jane G4 set... love to hear from @Kirk3190 about the changes from the G3. And as always a date for the customizer!!! First impressions... Pads look awesome... I prefer a pad with no breaks so my RGT's have been a bit of an adjustment. Outer roll looks smaller or at least tapered from the G3. Loving the graphic... Simple yet refined. Blocker looks massive from the angle of the photo. Not a fan of the look of Warrior pads usually but these look pretty good. The glove graphic looks REALLY really good there and it looks like it will feel like a more traditional glove as well from that photo. Get the G4 in the spring and keep the Optiks! Yes, now hang your head in shame. Anyone knows if the glove will still have the removable interns or go back to tradition? No way. Optiks all the way. The G3 had 13 color zones on the face of the pad. Based on the teaser pictures and the above, it'll be around the same amount. The placement of these color zones is key. 3 years in a row Warrior has done a great graphic. Look forward to playing with the customizer. @Hills - you won’t regret Optik, don’t worry! Not sure what it is... but I just can't get into their products (sticks aside.) There are certainly some great innovations with modular design, strapping, etc. And their colorways make for some amazing looking setups (especially in European pro leagues.) I do find it hard to get excited about a new release from them though. Maybe I'm just getting old and like what I know. Hell, I don't even know why I'm bothering to comment on something meant to get thoughts and opinions on the new line when I clearly don't have either. ...as in you're in the market for new gear and don't consider them an option or just casually browsing their stuff and nothing interest you? More the latter.. but because of that I wouldn't really consider them too much if I were in the market. Occasionally I look down at the other end at a guy who has a set of G3s I believe, and while he likes them I'm just sorta meh. I know guys who swear by Warrior's stuff will say I overlook the brand to my own detriment and that may be true. I think some of what they do is interesting, but wouldn't get a set. I guess as I write this and think about it, while I respect some of the features they roll out, I don't like the modular design and near infinite strapping and adjustments. I may be oversimplifying, and I'm happy to have anyone chime in and correct me, but I like a pad that is designed for something specific, not for everything. That said I'm also someone who knows what they are looking for in a pad and don't need it to give me 10 options i'll never use. Anywa ythe G3/4 offer everything to everyone, that's why Warrior offers the GT family. No way a company can accommodate every goalie with one pad. 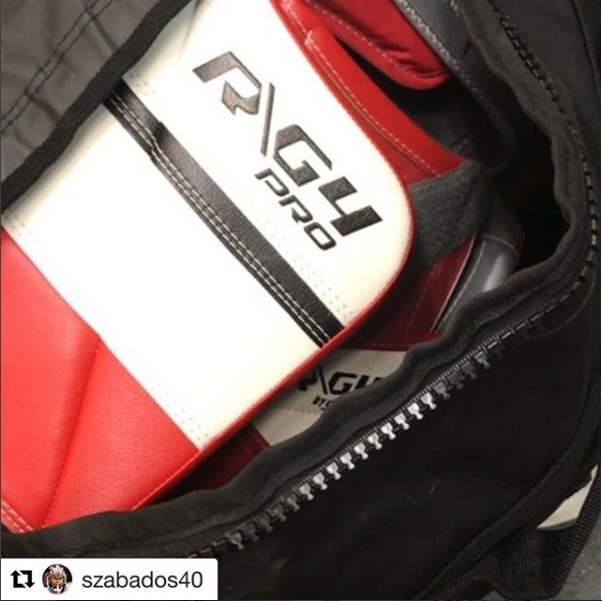 RBK/Reebok tried to do that by forcing their one pad down everyone's throat and that didn't work. 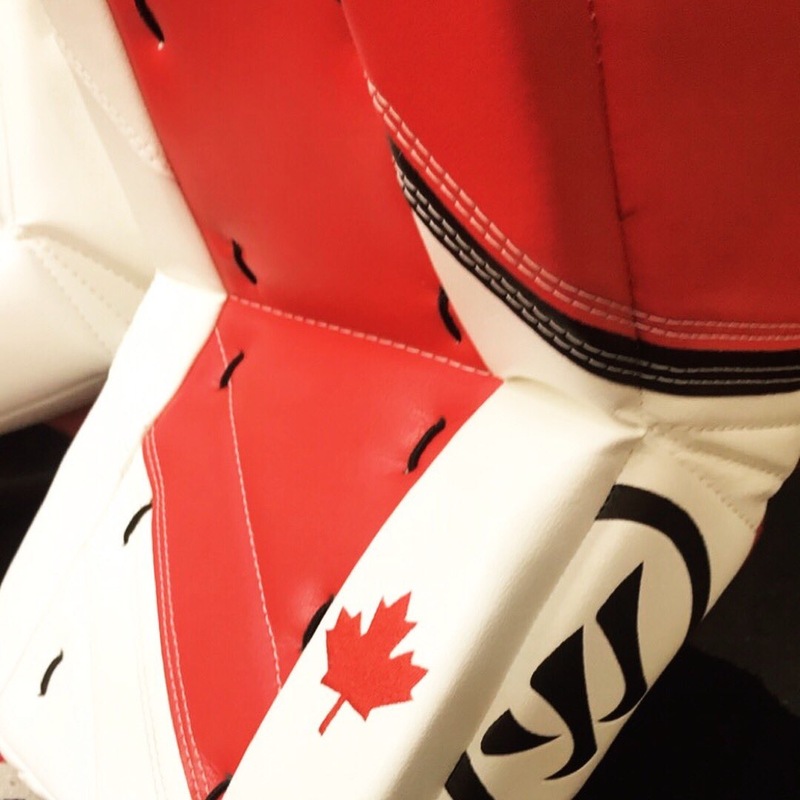 Warrior is still young and can be easily overlooked as a legitimate goalie company because of the lack of North American pro exposure. I was like that at first and I couldn't figure out why. They've made huge strides forward with their innovative ideas in their gear since their initial launch with the disastrous Messiah line. Until it is in your hands , their stuff can be very easy to ignore and not be considered an option for a consumer. Retailers in Toronto are scared to death to book any of their products. But hey, if you've seen it up close and played around with it and the gear doesn't interest you, that's really okay. No one can fault you for not feeling the same way they do. Like the Vaughn stuff no longer impresses me and my interest in them died several years ago. @BadAngle41, I was basically of the same mind when I started looking for new gear. Didn't have Warrior stuff in the mix at all. I was pretty much the same "I know what I like, so no point looking at the other stuff"
Wasn't until I tried on the pads in store that I started changing my mind. Everything just felt like it made so much sense in the design once it was on my leg. This was especially obvious when I tried them on with my old pad on 1 leg and the G3 on the other. It was obvious then that "what I liked" was basically just "what I was used to", and so was happy to dive into the G3's. @ULTIMA and @Puckducker... instead of quoting you both I'll say Thank You. Both of you hit on some of what I was trying to say but couldn't put it as eloquently as you both did. The lack of NA exposure is HUGE for the brand. 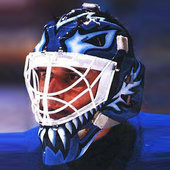 Oddly enough the same could be said of my Wall mask (until relatively recently w/ GoalieMonkey stocking them), yet I did make that purchase so there is hope for me. You're 100% right on the fact that what someone likes is very much tied to what they're used to. It's trusted. I'm with you on the glove though. I tried my buddy's Warrior on and while he's all about the ability to swap out internals for different breaks etc, I'm a 90 degree man. Lefevre. I've worn others like Heaton, Brian's, Vaughn... and always come back to Lefevre. It's the reason I bought 2 gloves with my most recent set. Are there any other pictures besides that one promotional pic? I'd love to see a break down of what's new and man do I hope they have a Sr. line for this set if they can keep the quality of the G3 Sr.
Blocker looks almost identical to the R/GT. Curved side finger protection and all. 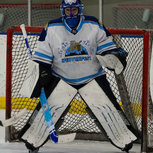 Aside from the leg pads, I bet the glove and blocker are going to follow the R/GT line in features. Blocker looks the same. Glove, bet ya it won't have the removable liners anymore and they may even remove the tent system they've had in the T since the G2/G3. IMO, the R/GT glove > the G2/G3 gloves. It just feels a hell of a lot better and has a better catching angle. (a whole 5 degree difference). The leg pads are going to continue with the custom break option above the knee, but it looks like they're going forward with the zero break at retail. I'm guessing that since the release of the R/GT line, they're going to differentiate the two lines even more. 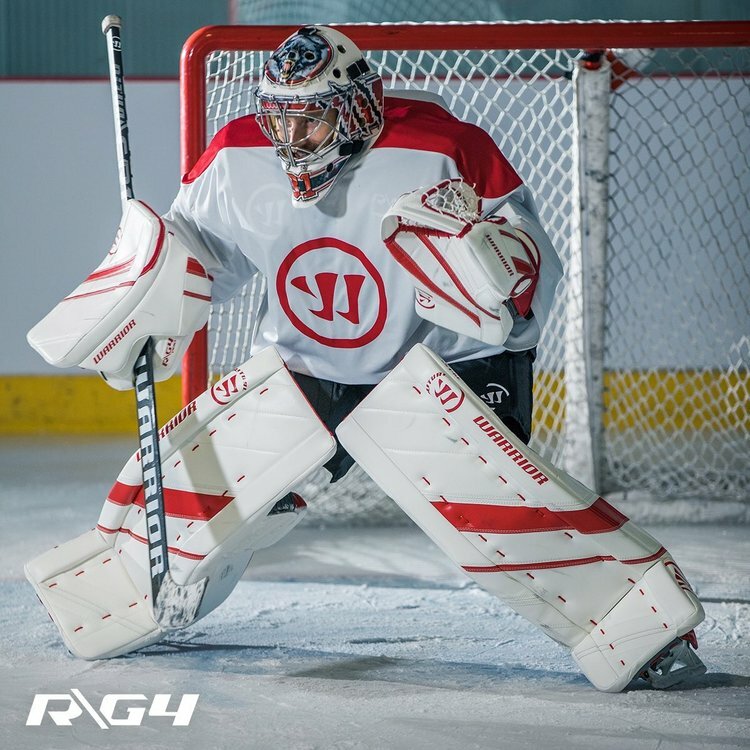 What I mean by this is that it looks like Warrior is going all in to making the G4 pad stiffer to compete with the 2S/Premier/Ventus/SZ3/Optik Fly lines, while keeping the R/GT to compete with the softer pad market. I also bet the the strapping will remain almost identical to the G3/R/GT lines. I also wonder if they'll adjust the post wedge. When I was ordering my G3's, I asked the guy about the G4's. He said they had a warrior rep at the shop to go over the new G4's (not sure if he was seeing a prototype, or something final). He said they were pretty similar to the G3's, with more small tweaks than anything really new. That is to say, nothing big enough that it would be worth my while to wait instead of ordering the G3's. But, that's all speculation of course, the guy wasn't super specific. I think @coopaloop1234 has the right idea with it. More about pushing the pad to compete with stiff pads, and differentiate more from the GT. @Pauly35or00 - check out the regular Warrior thread. @Murray took a pretty educated guess as to all the new features on the pro line. Love everything about them so far. Does anyone know what time of year they’re coming out?